The Giant African snail is large species of land snail that belongs to the family Achatinidae. It originates from East Africa, but it can be found all over the world today (it is especially numerous on the islands in the Pacific and Indian ocean). The Giant African snail resides in humid forests, wetlands, coastal areas, agricultural fields and urban areas. It is often collected from the wild and consumed as delicacy in Africa. Despite that, the giant Africa snail is widespread and numerous in the wild. Giant African snails can reach 3 to 8 inches in length and around 1.13 ounces of weight. A Giant African snail has large, conical shell that can be 4 to 7 inches long, and made of 7 to 9 spirals. Shells can be brown with dark-colored stripes, or reddish to yellowish-colored with vertical markings. A Giant African snail has two pairs of tentacles on its head. Eyes are located on the top of the first pair, while second pair bears sense of smell. The Giant African snail has large, muscular foot and well-developed tongue (called radula) covered with tiny spikes. A Giant African snail moves very slowly and produces slimy mucus to facilitate movement across the substrate. A Giant African snail is active during the night (nocturnal). It sleeps during the day hidden in the soil. A Giant African snail is vegetarian. It eats different types of leaves, fruit, vegetables and flowers. A Giant African snail consumes 500 different types of plants. Natural enemies of the Giant African snails are ground beetles, caterpillars, wild boars, rats and various birds. A Giant African snail hides inside the shell during extremely hot and cold periods of year. It can drastically reduce its metabolism and survive few months or few years without food. A Giant African snail is solitary creature. It meets with other giant African snails only to mate. They possesses both types of reproductive organs, but is requires a partner for the successful mating (self-fertilization happens in extreme cases). It lays eggs among rocks, leaves and dirt on the ground. Eggs hatch after 11 to 15 days. Young giant African snails reach adulthood 6 months after hatching. A Giant African snail can produce 6 clutches of eggs per year, each made of around 200 eggs. 90% of newly hatched giant African snails survive till adulthood. It has an average lifespan of 5 to 7 years. It can survive up to 10 years in the wild under favorable conditions. Rocky enjoyed his warm bath from Mr Whitton. Mr Whitton then placed him carefully on his hand. Watch carefully and see how Rocky moves. It is better to obtain snails from a captive-bred source and avoid wild-caught individuals. Wild snails can carry parasites which may affect humans. Miss O'Brien went to clean Rocky out this morning and found 59 little baby snails! Miss O'Brien was very shocked, Mrs Parkin was super excited and one little boy thought Rocky had shrunk! The children in the whole school loved handling all Rocky's little babies. Mrs Whitton took Rocky home for the weekend and gave the babies their own heated tank so they can grow up in peace from Rocky (who keeps pinching their food). If anyone would like to purchase one of Rocky's babies Acorn will be selling them for 50p each. 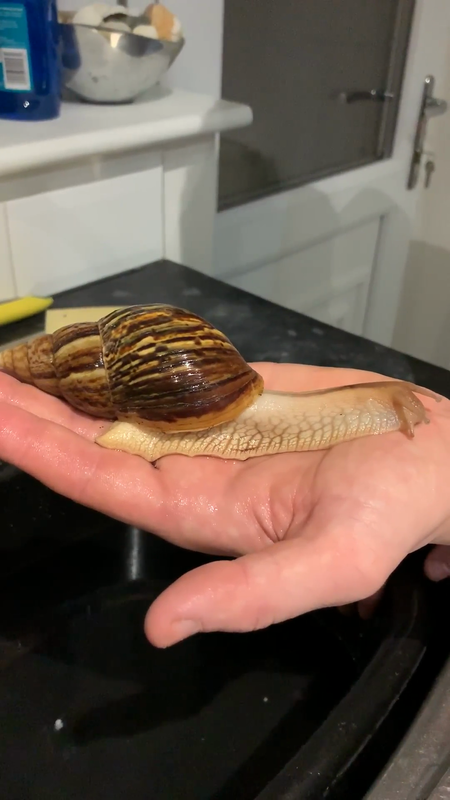 However please make sure you are responsible pet owners and follow the Giant African Snail care sheet below before committing to a new pet for a long time.